This week Amazon has Breaking Bad on DVD for up to 73% off, including the Complete Box Set on DVD. The incredible saga of high-school-chemistry-teacher-turned-meth-kingpin Walter White is here in its entirety: all 62 uncut, uncensored episodes! Emmy® winner Bryan Cranston portrays Walter White, a family man who turns to crime after a lung cancer diagnosis unravels his simple life. 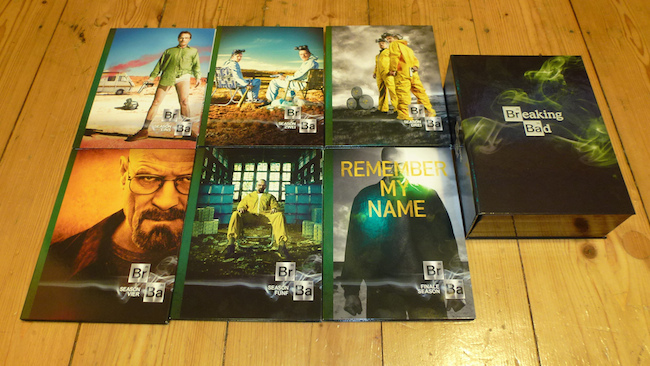 Breaking Bad: The Complete Series on DVD includes 21 discs and is nearly 3,000 minutes of footage. The set is only $61.99. If you already have some of the seasons and only need a few to complete the set, you can get individual seasons at a great price too. Get in on the deal, but hurry, the offer is for a limited time only.